Black locust (Robinia pseudoacacia) is an ornamental tree which can reach 40 to 100 feet in height at maturity. Seedlings grow rapidly and are easily identified by long, paired thorns. Leaves are dark green oval to rounded which alternate along stems in leaflets. In the spring, fragrant white flowers with yellow tips appear in drooping clusters. The tree is found frequently in thickets and waste areas and drained woods. All parts of the tree are toxic--seeds, leaves, bark and twigs. The main toxic component is robin--a plant phytotoxin similar to that found in castor bean and rosary pea. Horses usually don't eat parts of the tree, unless little other food is available to them. Consuming as little as 0.04% body weight can be fatal. Necropsy - Identification of robin or black locust seeds or plant components in gastrointestinal tract or blood. 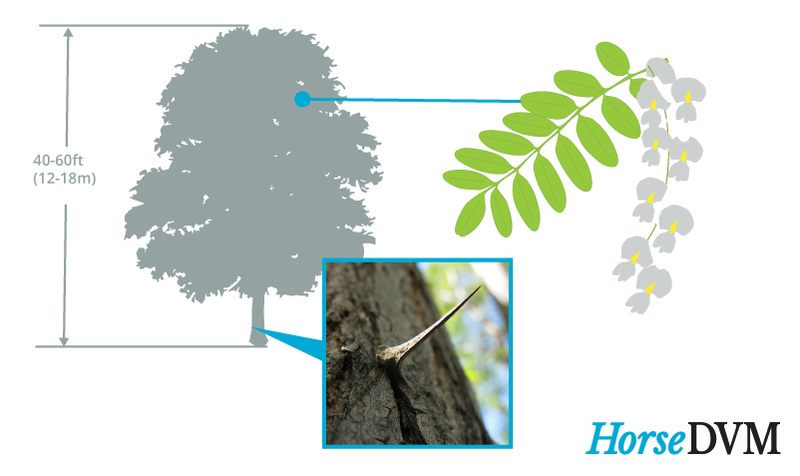 Allowing horses access to black locust trees in or around horse pastures.